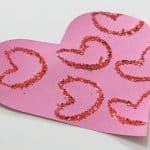 Are you starting your search for valentine crafts for kids? 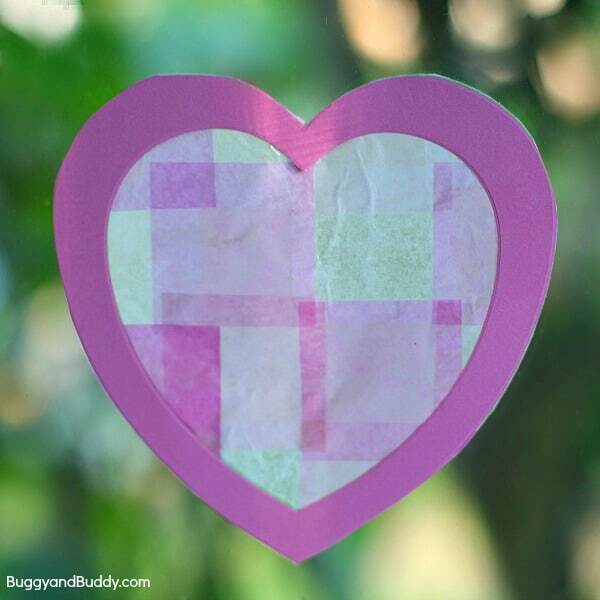 Here’s a classic suncatcher craft for kids using tissue paper and starch. 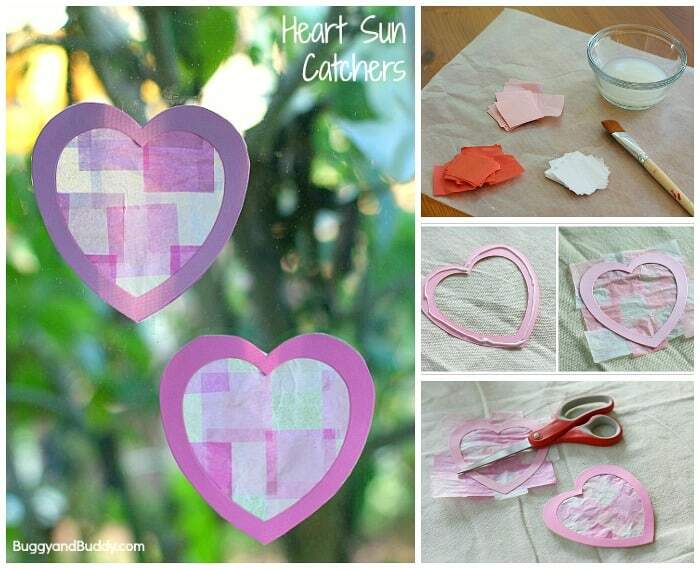 We made our suncatchers shaped like hearts to decorate for Valentine’s Day! 1. Pour the liquid starch in a small container and place your paintbrush nearby. 2. 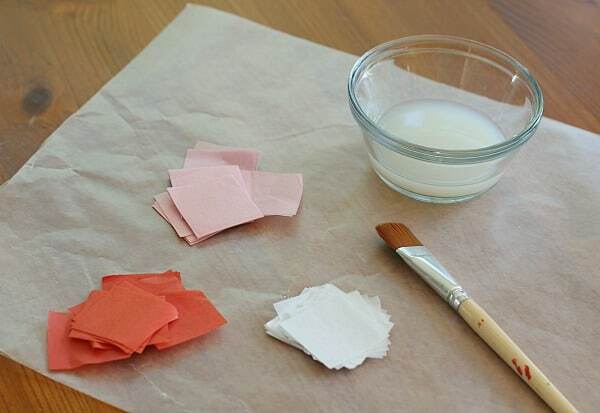 Tear out a sheet of wax paper and place it on the table. 3. 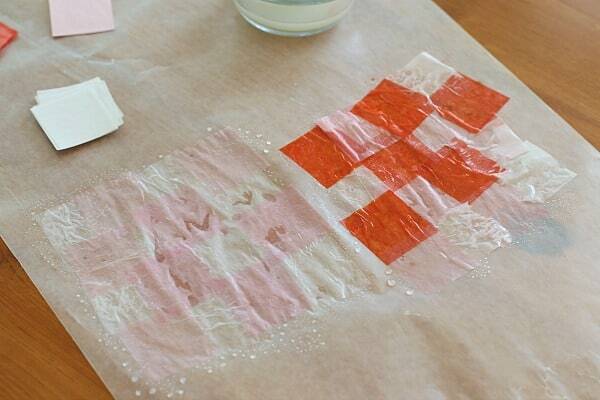 Place a square of tissue paper onto the wax paper. 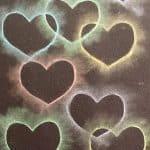 Paint over the whole square using the liquid starch and your paintbrush. 4. 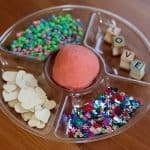 Continue doing this until you’ve covered an area as big as you want your suncatcher to be. 5. Allow the starch-covered squares to dry completely. 6. 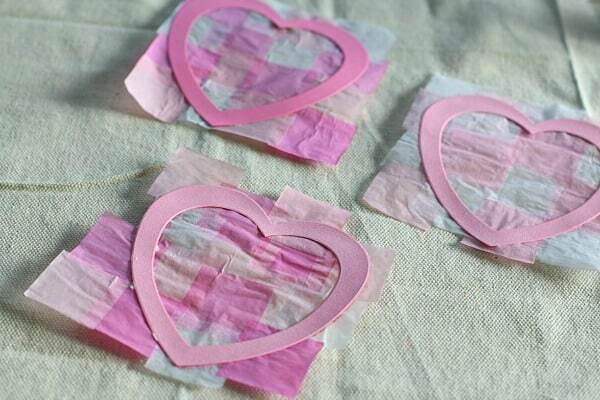 Once they’ve dried, carefully peel off the tissue paper. All the little squares will be attached together. 7. 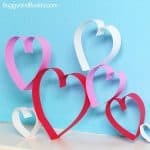 Prepare your heart frame: Cut out a heart shape from your construction paper. 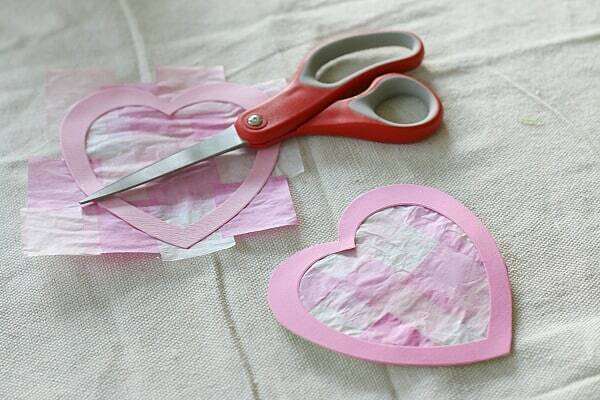 Then cut out the center of the heart to create your frame. 8. 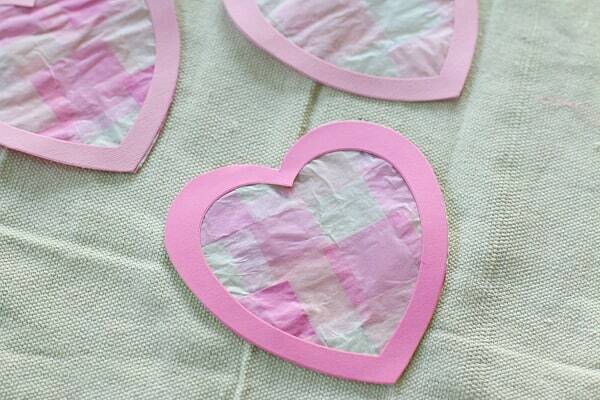 Glue the heart frame onto your dried tissue paper. 9. Allow the frames to dry. 10. Once the frames have dried, trim off the tissue paper hanging over the edges. 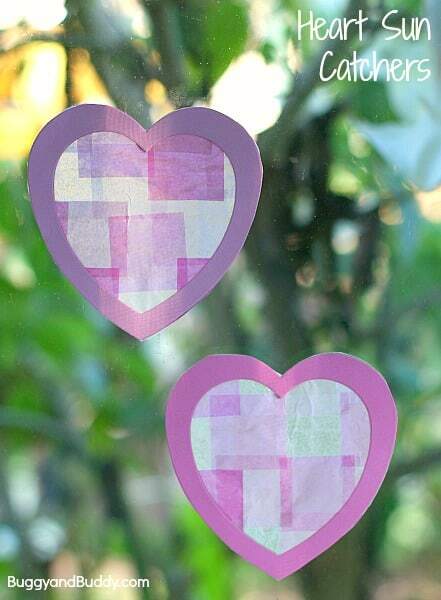 Hang your heart suncatchers up in a window or from the ceiling for Valentine’s Day! 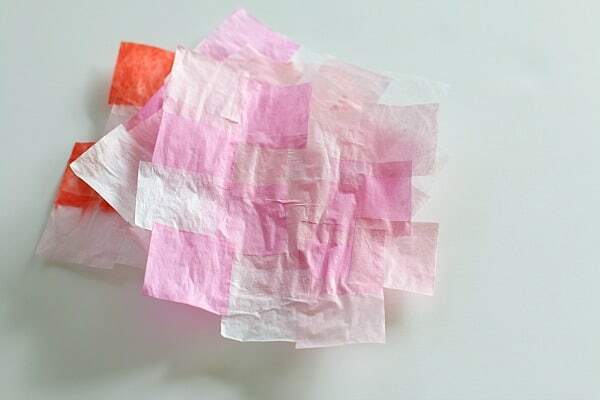 Some children find it easier to paint some liquid starch onto the wax paper before placing a tissue paper square on top of it. 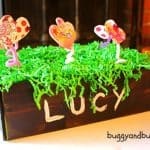 This helps hold the tissue paper in place as your child gently paints over it. 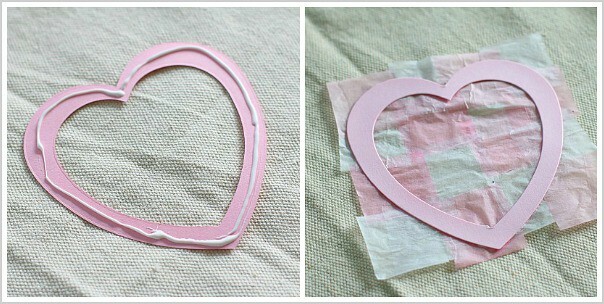 I used my die cut machine an heart-shaped die to make my heart frames. I purchase my liquid starch online in a package of six. I usually keep two bottles for myself and donate the extra bottles to teachers at my children’s schools. Some readers have also mentioned finding liquid starch at Walmart. How long does it take for the starch to dry? 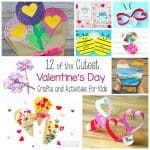 Do you think I could have enough time to do this for a classroom project at their Valentines party at school?